🚴‍♀️ Annie Cohen Kopchovsky - First woman to bicycle around the world! 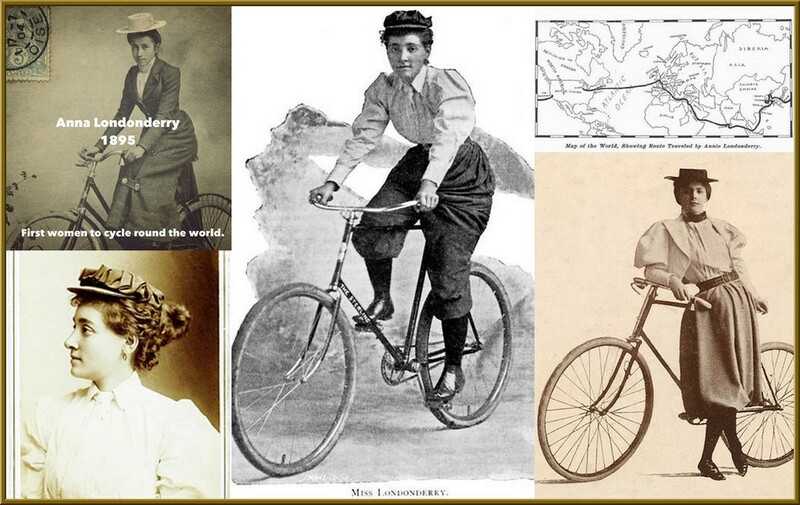 Annie Cohen Kopchovsky (1870–1947), known as Annie Londonderry, was a Latvian immigrant to the United States who in 1894–95 became the first woman to bicycle around the world. In the summer of 1894, a young wife, a homemaker and mother of 3, named Annie Cohen Kopchovsky hopped on a bicycle at the Massachusetts State House and set out to circle the world. She rode from Massachusetts to New York City, then sailed to France and rode through Europe and Asia. She had with her a change of clothes, a pearl-handled revolver, and boundless self-confidence. Most daringly, she wore pants instead of a skirt for most of the trip. Annie was a free-thinking woman. She carried advertisements for many different products on her bicycle and got paid to pose for pictures as she travelled across the globe. Annie was challenging the norms of what women could do in the 1890’s. She became a spokesperson for women’s equality and the women’s suffrage movement. A homemaker and mother of 3 traveling the world in 1890’s on a bicycle is so courageous and challenging for that era. Amazing!